I appreciate many things about Laurier, but what comes to my mind first and foremost is our ability to grow and change. Having been at Laurier for 20 years I have seen significant increases in our student population, as well as the corresponding evolution in the services necessary to support them throughout their time here. The willingness of Laurier faculty and staff to change and grow along with our students always impresses me. I appreciate the hard work that this often requires, but I am constantly inspired by the commitment of my colleagues to provide the best service and support to our students. This is what has kept me here for so many years. While I think it’s something that we have become known for, I truly believe our sense of community makes Laurier unique. As part of Information and Communications Technology (ICT) at Laurier I am fortunate to work with a wide range of clients and I am always struck by the shared sense that we are all part of a collective that is constantly striving to enhance the learning experience for our students. In turn, I am consistently reminded that our students give back to our community in the same way, offering feedback and suggestions on how ICT at Laurier can be even better. A perfect example of this was when we went through the process of renewing the website. There were so many groups involved – from students to faculty and administrators – and throughout the project everyone worked together to build something that I think truly reflects who we are and what Laurier is all about. This would not have been possible if we did not have such a strong sense of community. Being so new to this role I think it’s difficult to say because I am still learning and balancing expectations, but the challenges that the CIO role presents are exciting. I look forward to working with the Laurier community to understand how ICT can best serve their needs while also working to help them understand the value ICT can add when we are brought in as a partner on projects that involve IT. 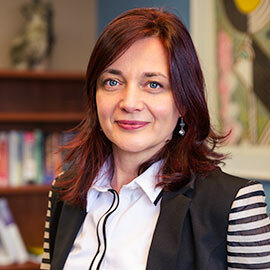 As we continue to stay on top of technological advancements in teaching, learning, and research, we will have to keep an open dialogue between ICT and the rest of the Laurier community to ensure that everyone’s needs are met, while maintaining a mutual understanding of each group’s expectations and bandwidth.